This is the perfect cardigan for spring, autumn and winter. Cute and cosy with short sleeves so your little girl can play without long sleeves hindering her movement. 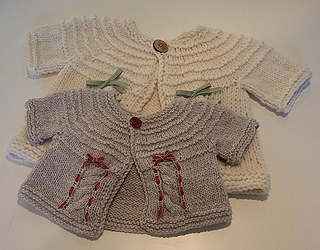 Quick and easy to knit in DK (for the first 3 sizes) and Bulky for the remaining sizes. Check out the free co-ordinating Poppy and Aviatrix hat patterns. Errata will be available here and on the Just Jussi website, the pattern you purchase will always be the most recent version will all known errata corrected. 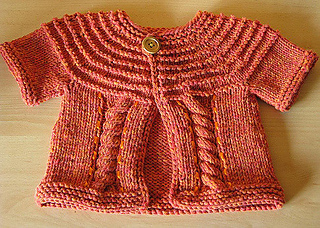 If you purchased the pattern on Ravelry you will be electronically notified of any updates and they will be free of charge. 2.6(3.5, 4, 4) ounces = 205(275, 345) yards DK yarn – I used NZ Naturally DK pure wool. 8.8(8.8, 9.7, 10.5, 12, 14) ounces = 320(320, 350, 385, 435, 512) yards Bulky yarn – I used Patons Inca which is a blend of wool 50%, alpaca 20% and acrylic 30%. All sizes: 2 x st markers, 2 stitch holders, tapestry needle.